VANCOUVER, BC – January 8, 2009 – Mirasol Resources Ltd. (TSX-V: MRZ; Frankfurt: M8R) is pleased to present an exploration update and announces the commencement of a 4000 metre reverse circulation (RC) drill campaign at its 100% owned Claudia Project, covering 1,195 square kilometres of claims adjacent to Anglogold Ashanti’s 5 million ounce Cerro Vanguardia gold mine in Santa Cruz Province, Argentina. Ongoing exploration at the Claudia Project is 100% funded by Mirasol’s joint venture partner, London- listed Hochschild Mining Plc. (LN:HOC). The terms of this agreement provide that Hochschild invest US $6 million in exploration over 4 years and make cash payments to Mirasol to earn 51% of the project, with further provisions to reach up to 75% interest in the Claudia property (news release February 26, 2007). A comprehensive program of exploration is ongoing at Claudia (Figure 1). To date, this includes surface rock chip sampling and geological mapping of epithermal veining and outcropping Jurassic volcanic units. A 4,300 line km high resolution ground magnetic survey, 93 line kms of gradient array IP/resistivity geophysical surveys, and orientation MMI (Mobile Metal Ion) soil sampling, were completed. Phase one reconnaissance diamond drilling, totaling 3,780 metres was completed in late 2007 to test multiple targets, both outcropping and covered, on the western side of the property. Gold and silver mineralization has now been identified in rock chip and soil sampling at five prospects across the Claudia claims. As previously announced, the best rock chip assays report to vein zones at the Vanguardia Sur prospect, immediately south of the Cerro Vanguardia Mine leases, and at the Rio Seco vein zone located some 20 kms to the southeast. These prospects respectively host 4.0 kms and 2.8 kms of outcropping vein trend, and both occurrences extend under shallow gravel cover. Best rock chip results from Vanguardia Sur (news release August 3rd 2006) include 0.9 g/t gold and 167 g/t silver with strongly anomalous lead and zinc, while best results from the Rio Seco zone (news release November 25th 2005) returned channel samples of up to 0.7 meters at 14.2 g/t gold and 229 g/t silver, associated with elevated indicator elements of antimony, arsenic and mercury. Studies of the volcanic stratigraphy at the Cerro Vanguardia Mine have identified two volcanic units, the Masiva Lajosa and the Granosa, whose brittle character has been a key factor controlling vein formation and the distribution of the majority of high grade gold and silver ore at the Mine. 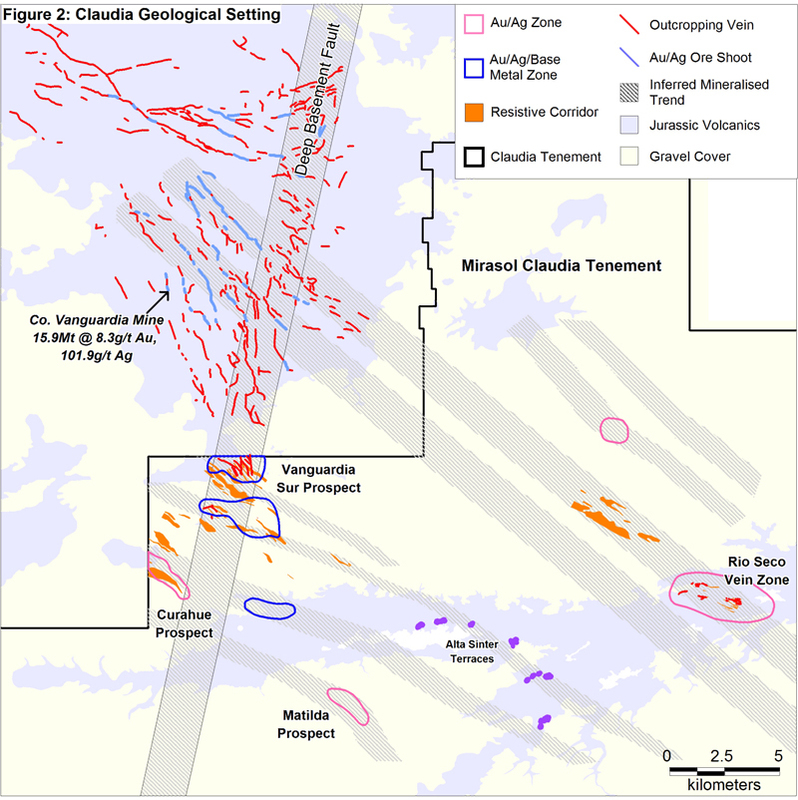 Recent mapping by geologists from the University of La Plata, Argentina has demonstrated that the Mine sequence volcanics continue on to the Claudia claims and importantly, that the Masiva Lajosa and Granosa units are widespread at Claudia, with the Granosa hosting gold-silver veins at the Rio Seco zone. Integrated analysis of results of extensive geophysical studies, project geology, with published geology for the Cerro Vanguardia Mine, has allowed development of a preliminary structural framework for the district (Figure 2). This highlights a series of corridors, thought to represent deep-seated fault zones, that controlled gold-silver vein emplacement at the Cerro Vanguardia Mine. These corridors project on to the Claudia claims, hosting known vein occurrences at Vanguardia Sur and Rio Seco prospects, and highlight gravel-covered volcanic units that are the focus of the current covered exploration program. MMI soil geochemistry, IP/Resistivity geophysics and the ground magnetic survey have been used to prioritize covered drill targets along the structural corridors. During 2007, Hochschild drilled 26 diamond holes on the western side of the property, which tested a range of gravel-covered geophysical targets and mineralized veins. Better results were obtained from Vanguardia Sur, where gold-silver assays appear associated with structural zones that overprint broader intervals with visible base metal sulphides. Observations of drill core show base metal anomalies are developed in strongly altered structures up to 10 metres wide, with lead and zinc assays in the range 500 g/t to 1%, overprinted by pyrite-silver veins with a peak assay of 0.93 meters @ 294.9 g/t silver. Late- stage, sub-meter epithermal quartz veins and fault breccias follow, with gold assays ranging from 0.93 g/t to 1.2 g/t. These results suggest that a strong, multi-phase mineralized system is present at Vanguardia Sur. Exploration to date at the Claudia Project has tested only a small part of the large, prospective claim holding that adjoins the largest operating gold mine in southern Argentina. Ongoing exploration is adding to our understanding of controls on mineralization and suggests that there may be a district-scale zonation from silver (gold)-base metal dominant at Vanguardia Sur, to gold-silver epithermal dominant at the Rio Seco prospect. This provides a directional vector for further exploration towards the southeast, under shallow gravels. Mirasol’s partner, Hochschild Mining, has initiated its 2008-2009 drill program, which is planned to include up to 4000 meters of RC drilling on a range of outcropping mineralized veins and covered geophysical and/or MMI soil geochemical targets. This program will include first pass drilling of high grade gold silver veins at Rio Seco, follow-up drilling of extensions of the silver gold base metal veining at Vanguardia Sur, and is also planned to test a range of covered geophysical and MMI soil targets at the Curahue and Matilda prospects to the west and south west side of the Claudia project. Results to date continue to support Mirasol’s exploration premise that the prolific Cerro Vanguardia vein field continues on to the Claudia claims. The outcropping vein systems at Vanguardia Sur and Rio Seco, while valid exploration targets in their own right, may represent parts of a larger epithermal field concealed under extensive shallow cover at the Claudia Project. Hochschild Mining Plc does not accept responsibility for use of project data or the adequacy or accuracy of this news release.